At Femme Fatale DC, the Pop-Up Shop for Women Business Owners in Tenleytown DC, I met Christina Kim of Secret Cacao Garden. Although she didn’t have a stand of her own at Femme Fatale DC, she was working at some of the booths, and taking part in some of the events. She agreed to let me interview her with the same mini interview I’ve been using to interview the local small business owners with brick and mortar stores in Tenleytown. She agreed to answer the questions on video. Here is the interview. My name is Christina Kim and I am the owner of Secret Cacao Garden. 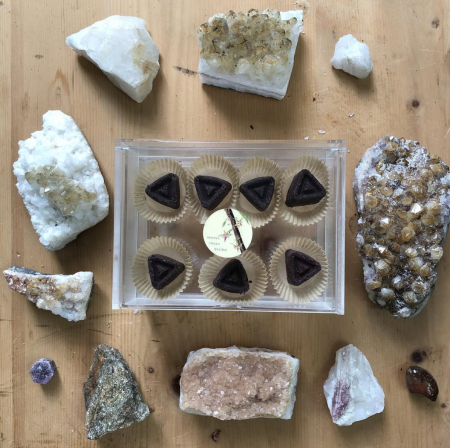 The chocolates I make are healing chocolates where I get the ingredients directly from a single origin, they are also organic. I use them as a canvas to pair with local healing plants. For example, chamomile or nettle. I would infuse those into the chocolates so that there is perfect chocolate at the end with no sugar additives. This just highlights the benefits of the cacao, it really is an amazing plant. It’s really beside the business. The first thing was that I couldn’t find chocolates like this. I was looking for pure chocolate that tasted good and where I would know where all of the ingredients are from. I just didn’t see it in the marketplace, so I started creating it and when i saw how easy it was after doing all of the research, I wanted to share it with other people. It wasn’t just for me, I wanted to share this amazing plant with my friends, my family, and people I didn’t know because a beautiful plant like this needs to be shared and recognized for its benefits. Also everyone who works hard at getting this product to us, like the farmers with their care and the cacao buyer who makes these relationships with the farmer and then finally to me or my friends who can order these online directly. It is so amazing to me in this time right now, this era where we can just with a click of a button have beans from Guatemala here and to be able to give money directly to a farmer, whereas in times before Nestle bought out all of the cacao farms and would pay the workers very low wages, maybe a few pennies a day. Now, here today I am directly helping a farmer raise his kids and send them to school. I just think this concept is really beautiful and the taste is beautiful, so I decided why not share it and hopefully I am able to keep doing this, because it is my passion. Tell us how you got involved with Femme Fatal. I’ve always had Femme Fatal on the radar as artistic, beautiful, and empowered women and I started following them on instagram. I was a little intimidated because there amazing women were so confident in everything they do and that’s what I wanted to be like. I saw that they had a bunch of openings for this summer’s pop-up, and I applied and I got in, and at the same time I was going through a bunch of life changes. I quit my job, I took a trip to Mexico which I thought was very important for my cacao business. In my heart I knew I had to go after this cacao business, but after I came back I had no money left, so I was like “it’s okay” and they [Femme Fatal] know who I am and I know who they are, so I’m going to find them and try to be a part of it [the summer popup.] Luckily it worked out, because I was taking herbal classes with April who is the herbalist at Antler Alchemy, which is also here and shares a booth with PAX Apothecary. They had a volunteer position at their booth and I was able to come and help out and reconnect with Adrianna who originally contacted me. I talked to her and was able to apologize about having to pull out because this is the place I really wanted to be and she let me hold cacao workshops here and it is my dream come true, so its awesome and I love being here. My favorite thing is that I get to finally create directly and be in control of a beautiful product that I can create and make. I guess that part of the business I like but everything else I don’t like, admin and stuff like that. I’m learning and appreciating the importance of business as I go along. The best advice I have ever received was to open your heart and to say yes to opportunities. I quit my job, all of it kind of happened because of the cacao. I just fell in love with the chocolate making process. It was my creative flow. It just came out of me into the chocolates. I do believe that when I’m making chocolates I am in such a happy and blissful state of doing what I love but also imagining the future, and of harmony, and of a better place. I think this comes through in my chocolates. The ones that I do give out and that my friends try. I sold them at Dorjee Momo for a while, and at Calabash. DC owned business. They were really behind it and felt the energy behind it and so I kept saying yes to the opportunities and ended up leaving my job, I knew I wanted to go for this 100%, like I was on a momentum and I was going to ride it. Sometimes I thought I was crazy like, I’m spending all of my money on chocolate right now and I have maybe two months worth of rent money left and I’m ready to start a business. I started buying cacao, grinders, table stuff, presentation stuff, things I didn’t really need to buy at the time. Long story short I thought I was going to go to NJ to my parents and I told them “look I spent all of my money, I was trying to go for my dreams and I’m broke.” They said to come home. I thought that if thats what I have to do to be stable and to continue, then I will do that, but then inside my heart I prayed for a little more time in DC and maybe something will happen. The next day my friend texted me saying that she had a room for two months in DC that I could stay at for free. She knew I was passionate about it and told me that i should just go for it and so here I am at Femme Fatale. I have two months to do my thing and I have a few chocolate events this month with Femme Fatale, Common Goods City Farm, my friend from Paul Productions for mental health and coping through chocolates and a workshop for women to teach empowerment and finding their self identity and self love. Lots of exciting things. I would like to add that you should always go for your dreams, it will come true as long as you put that energy there and if you know it in your heart and your gut, you’re right and don’t let anyone tell you otherwise. I would like to thank everyone that I’ve met along the way, my parents, friends, and especially everyone here at Femme Fatal. April, Nicole, Dorjee Momo, just all the amazing people. When you follow your dreams people who love you will be there for support and I’m so thankful them in my life. Finally I would like to thank Mother Earth and this Universe, because it’s magical. 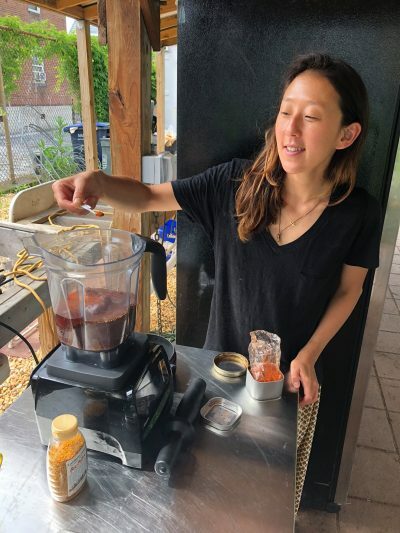 Would you like to meet Christina Kim and try some of her healing chocolates? Visit her at Femme Fatale DC in Tenleytown, 4620 Wisconsin Avenue, NW, Washington DC 20016. Or visit Secret Cacao Garden online on Facebook or on Instagram.